For Puppies 9-14 weeks. 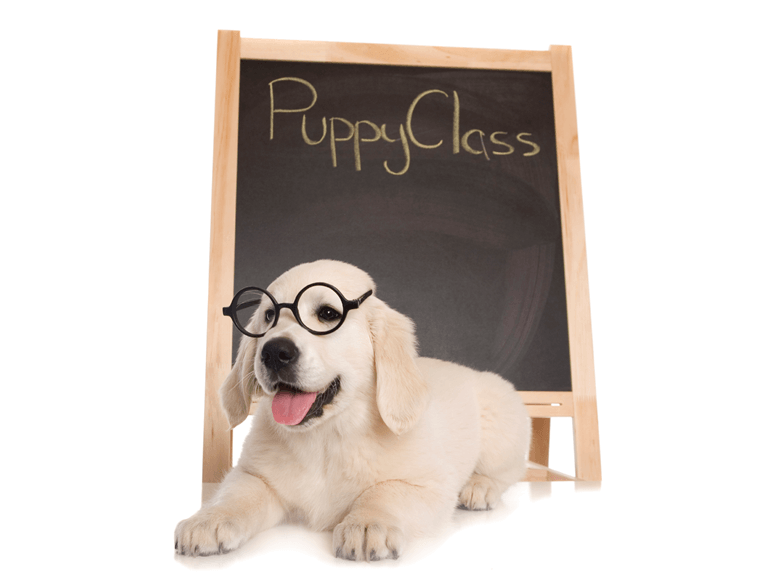 Our puppy classes have filled very quickly but we have added extra classes! Just note that the times will vary to be able to fit you in! On Sat 27th April we have added a 9am time and then from May the 4th we are back to the normal time of 8am! Don’t leave it until your puppy or dog has problems; by then it can be too late. You will never again get such an important period of time in your dogs life; you have approximately 6 weeks to make the most of it (10-12 weeks is ideal). Puppy classes are like the foundations of a house; build them properly and you will prevent problems later on. If problems arise over time then it is much easier to fix a puppy who has strong foundations. Well run puppy classes like ours should develop social skills (not just play but a good balance of appropriate social behaviour). They are critical for developing bite inhibition, confidence, basic training and trust. We will cover health care, handling & puppy problems. Foundation training is covered but there are a lot of important things to cover in puppy classes so most training commands come later (you can teach an old dog new tricks, but you cannot get the same benefits of socialisation after 16 weeks of age). Your puppy must have been in its home for 10 days or more & isolated from public places (an essential quarantine period for the safety of your puppy and others in the class). Puppies must have had at least their first vaccination & be up to date & current with vaccinations. If your puppy is fully vaccinated and able to go out in public please see Clever puppy training. The location is 1537 Thomas Road in Oakford (near the corner of Nicholson Road). Each class runs for 40 minutes. Details are emailed through after booking. Included in the price is a comprehensive puppy booklet (written by Sarah of Clever Creatures) to help reduce and prevent puppy problems. You will also receive a free lead. The price includes 4 classes. We have a maximum of 6 puppies in each class; however during busy periods we will run a larger class (divided up) with 2 trainers. The class runs at 8am on Saturdays for 4 consecutive weeks (unless another class structure is prior arranged). Each class runs for 40 minutes. Full details will be emailed to you after booking. We generally allow 1-2 new bookings for each week. The classes are held on a private property in Oakford where only vaccinated dog and puppies are allowed to attend. Some of our recent feedback! “Thank you so much for this morning – it was really great and JUST what we were wanting for Jack (and us)”. We started puppy training with our puppy Bella 3 weeks ago and have been amazed at the difference already. Bella started off timid and snappy and has become more confident each week. We have learnt a lot about her naughty behaviour and how to train her in a more positive way. The classes and trainers are great and the puppy class booklet has been really helpful to read at home. We will be back for teenage puppy training soon!